It wasn’t the ending players, coaches and fans wanted, but if anything, UW’s 24-21 loss to Brigham Young in Wednesday’s Poinsettia Bowl was entertaining and exciting — at least in the second half. The Cowboys (8-6) followed a familiar pattern as the season concluded. Slow or sluggish starts to games — even extending to the first half and third quarter — and then a furious rally late. But just like in the 27-24 loss to San Diego State in the MW Championship Game on Dec. 3, that rally fell short. — Disappointing to see junior running back Brian Hill benched for the first quarter by third-year coach Craig Bohl, who said after the game it was a “coach’s decision.” Obviously, Hill didn’t do anything earth-shattering wrong, but disappointing to see. Would things have changed if he played? Maybe, maybe not. Hill played well when he returned (93 yards, 1 TD, and one catch for 19 yards). I thought senior Shaun Wick played really well — even when Hill returned. Wick had 13 carries for 55 yards and caught one pass for six yards. — Sunny San Diego didn’t live up to its hype. Yeah, the game was at night but it rained like crazy in the first half. Both teams had to play in it, but it definitely affected UW the worst. A bobbled snap on a punt (the snap was good) and a botched hold on a field goal (the snap was good) cost UW dearly. Other shortcomings cost UW, but those special teams gaffs hurt a lot. Wyoming has faced its share of good running backs this season. It played against the NCAA’s all-time leading rusher twice in San Diego State senior Donnel Pumphrey. Boise State’s junior Jeremy McNichols, Nevada junior James Butler and a whole host of backs at New Mexico were others, and that’s just in conference play. The Cowboys will see another one in Wednesday’s Poinsettia Bowl in Brigham Young senior Jamaal Williams, who is the Cougars’ career rushing leader with 3,691 yards. I asked a couple of UW defensive players if Williams compares favorably to any of the backs they’ve faced this season. 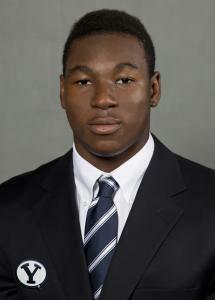 Williams is listed at 6-foot-2, 215 pounds. He missed three games with an ankle injury, but he ran for 1,165 yards, 11 touchdowns and averaged 5.6 yards per carry. His longest run was 62 yards. He also caught seven passes for 80 yards. Here’s the replay of my weekly live chat on University of Wyoming sports Thursday. Most of the talk was about UW football as it continues its bowl preparations for the Dec. 21 Poinsettia Bowl against Brigham Young in San Diego. Recruiting also is picking up again for the Cowboys with a couple of recent verbal commitments. There was some talk on UW men’s basketball, which has gone 4-0 on its six-game home stand. Conference play is less than two weeks away. One of the many cool things for players who participate in bowl game are the gifts they receive. Wyoming senior long snapper Brendan Turelli has been kind enough to provide the Wyoming Tribune Eagle, Laramie Boomerang and wyosports.net a daily take on what’s going on with the Cowboys as they prepare for Brigham Young in the Poinsettia Bowl a week from today in San Diego. In Turelli’s latest piece, he describes what UW and BYU players are offered in what is called the “gift suite,” which nearly every bowl offers. Before Santa jumps down chimneys of millions of homes, six of the seven Mountain West football teams will be done with their bowl games. On the first weekend, the league went 2-2 in bowl games with Utah State and Air Force winning, and Nevada and Colorado State losing. Not trying to brag, but I went 4-0 in my MW bowl picks, so here are two more to bring you into Christmas. A home game for San Diego State, and its fifth straight bowl game. Prior to that, the Aztecs played in only five bowl games over the previous 43 years. San Diego State was first in the MW in total defense (337.6 yards per game) and scoring defense (20.1 points per game). It also was pretty solid against the run (145.6 ypg). Navy led the country in rushing (345.1 ypg) in its option-oriented offense. San Diego State is somewhat used to playing against the option having faced and beaten Air Force earlier this season. Look for some trick plays from both teams, and the Aztecs to win a close one. San Diego State 23, Navy 17. This season’s college bowl game schedule is out, and the Mountain West has six bowl ties — one more than last year. The bowls are: New Mexico, Las Vegas, Famous Idaho Potato, Hawaii, Poinsettia and Armed Forces. The new edition is the Famous Idaho Potato Bowl in Boise, Idaho, which the Western Athletic Conference had a tie with last year. 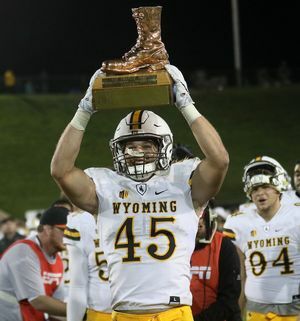 Wyoming needs one more victory to become bowl eligible, and it’s an early 25-point favorite to beat 1-9 New Mexico Saturday in Laramie to get that seventh win. It’s a pretty safe assumption if the Cowboys are bowl eligible that they will play in their second bowl game in three years. But there are some interesting dynamics that could alter their bowl chances so I thought I would throw out some nuggets for you to think about and comment on.